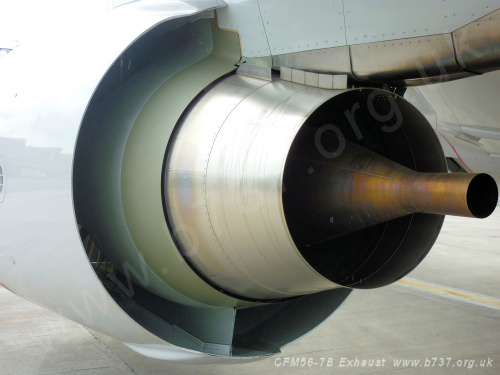 The 737 NG Performance Improvement Package (PIP) was a series of aerodynamic and engine improvements including refined wing control surfaces, redesigned wheel-well fairing, a streamlined anti-collision lights, ECS inlet/exhaust modulation and the new CFM56-7BE "Evolution" engine (see powerplant). The total fuel saving with PIP is 2%. The PIP was introduced as standard into production 737 NGs in stages from line number 3570 in March 2011 to line number 4302 in December 2012. Some of these improvements have also been made available for retrofit to earlier NGs. The diffuser contours of the high-pressure compressor (HPC) outlet guide vane (OGV) are optimized to improve the diffuser-area ratio and reduce pressure losses. The OGV replaces the two-dimensional airfoil with a three-dimensional design. A new high-pressure turbine (HPT) incorporates modified blades for aerodynamic improvements that increase efficiency and durability. The HPT rotors have been modified to accept a reduced blade count, from 80 to 76. A new low-pressure turbine (LPT) incorporates new optimized blades, vanes, and rotors. The number of blades and vanes has been reduced by approximately 9 percent overall. New disks and retainers match the blade count, and new case and shrouds match the new axial staggering. A new primary nozzle is approximately 18 inches (46 centimeters) shorter than the previous engine and has recontoured lines for improved nozzle coefficients and losses. An acoustically treated honeycomb lining incorporated into the primary nozzle’s inner wall ensures no increase to community noise occurs as a result of this efficiency improvement. A new strut aft fairing heat-shield assembly has been incorporated with heat shield blankets and an inboard plume suppressor. These components will reduce aft fairing thermal distress and are required to accommodate the short nozzle configuration. The primary plug has been recontoured for improved plug coefficients and losses. An oil drain pan and tube are installed to reduce oil pooling within the plug. 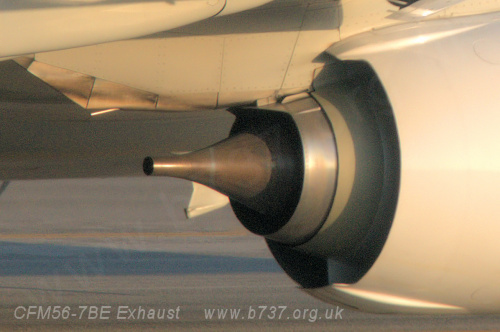 The 7BE engine can be identified by the exhaust configuration. The nozzle is 18” shorter and exhaust plug is 2.5” shorter, although it looks longer because of the much shorter nozzle. The heat shield above the nozzle has new titanium pans, inboard plume suppressors and side scoops to cope with the higher temperatures from the new short exhaust configuration. The only slight disadvantage was a revised (slightly reduced) in-flight starting envelope and a revised procedure with a more formal definition of a warm vs. cold engine. 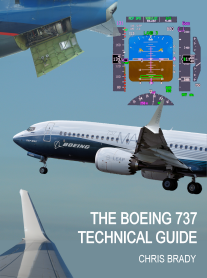 Boeing took the decision to adopt the new restricted in-flight start envelope as the common standard across the NG fleet for simplicity and to allow engine intermixes. The -7BE will be able to be intermixed with regular SAC/DAC or Tech Insertion engines subject to updated FMC, MEDB and EEC. From L/N 3570 (March 2011) onwards, the upper and lower anti-collision lights were changed from a cylindrical to an oval shape to reduce drag. The upper skin was revised to reduce the risk of crack migration. This upper skin revision eliminated the weight reduction milling of the doubler in the area under the light but, because of the structural change, no retrofit has been offered. From L/N 3570 (March 2011) onwards, the aft halt of the main wheel well farings (the half that face forward into the airflow) have been reshaped from a rectangular to a curved form to reduce drag. 1. 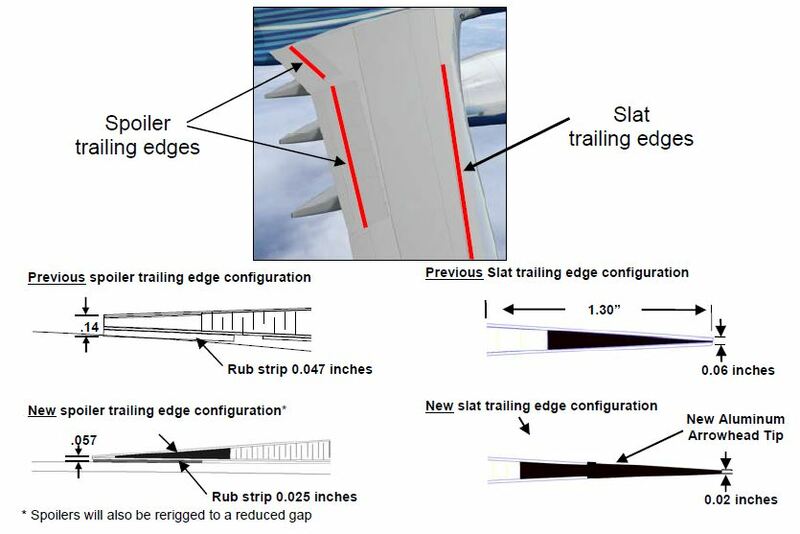 A reduction in the spoiler trailing edge thickness on spoiler 1, spoilers 3 through 10, and spoiler 12.
caused by the aft-facing step on the trailing edge of the spoilers. The trailing edge (extruded) aluminum filler is replaced with an aluminum machine tapered filler (to .020 inch).This will necessitate revision to the honeycomb core and end ribs. In addition, the thickness of the trailing edge rub strip will be reduced in thickness (from .047 to .025 inch). This change reduces drag by reducing the gap between the spoilers and the flaps. These gaps were initially set to a higher nominal position to improve the lateral control handling qualities on the 737-700. With various lateral control system changes, the increased gap sizes are no longer needed and have therefore been reduced. 3. A reduction in the thickness of the slat trailing edge. 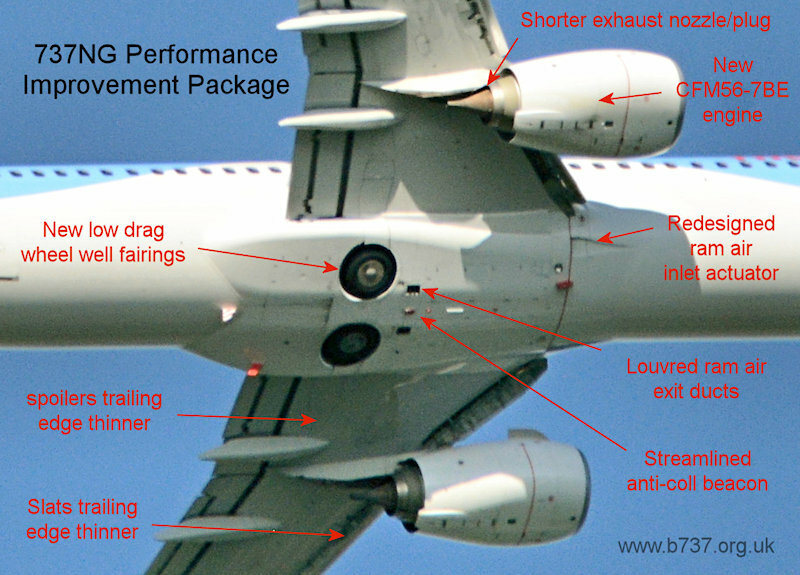 This change will reduce drag by reducing the thickness of the trailing edge wedge. This will necessitate revision to the honeycomb core and upper/lower skin panels. The existing fiberglass filler will be replaced with an aluminum machinetapered (to .020 inch) arrowhead. The new spoilers and slats are fully interchangeable and intermixable with the previous spoilers and slats. Retrofit is at customer discretion. From L/N 4302 and on (December 2012) The existing ram air inlet actuators were replaced by new "smart actuators" which give position feedback and communicate with the added ram air exit actuators. The inlet actuator is mounted at a slightly different orientation than the current actuator, requiring changes to the airplane structure to accommodate, so retrofit is not available. The ram air exit was changed from a plain oval shaped duct opening to a rectangular duct with three exit louvers. The exit louvers are actuated by a series of shafts and linkages that are driven by the added exit actuators that are the same part numbers as is being used on the new inlet actuators. 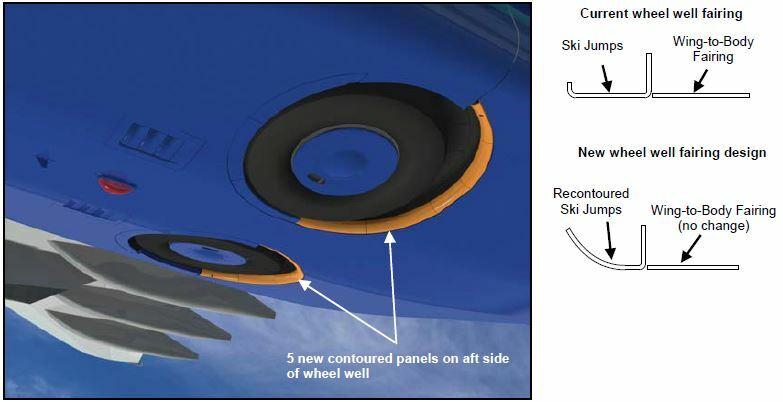 To accommodate installation there are structural changes forward of the wheel wells on both sides of the aircraft. 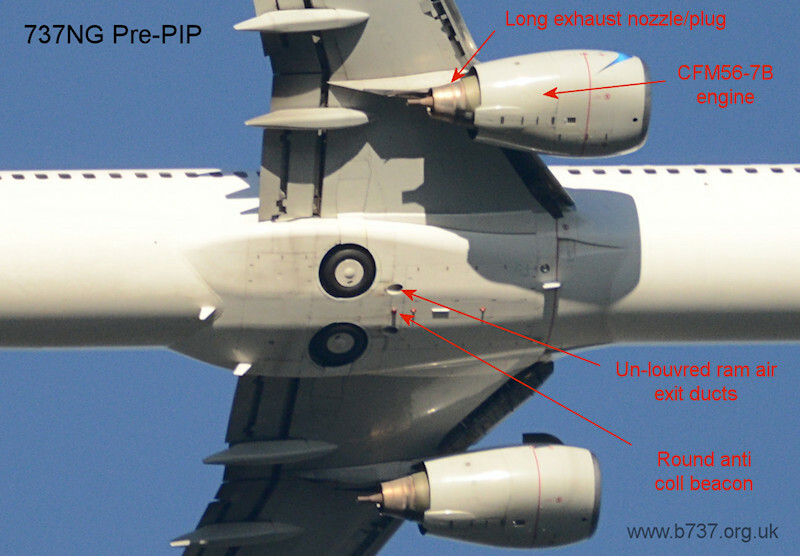 The system (inlet and exit) is tuned to open and close together at a very specific relationship to optimize thrust recovery of the air exiting the exhaust louvers, thus reducing fuel burn of the aircraft.